Find laminated glass in a sensational selection at PRL. Indoors or out, this product can meet a host of decorative and safety glass specifications for office, commercial and homes. Perfect for areas that require safety glass or unique decorative, entrance systems, handrails and guardrails, this glass line has a lot to offer. Available with a wide range of interlayers and make-ups, our many laminated glass products and lead-times that can’t be beat. At PRL, we manufacture countless laminated glass make-ups in-house. Utilizing glass combinations that’s annealed, heat strengthened or tempered, we can produce sizes up to 96″ x 155″ and thicknesses from ¼” to 3″. Tinted, reflective, patterned and more, our state-of-the-art lamination line can accommodate almost any glass type. Offering added strength and security, our laminated glass conforms to industry standards. We deliver a vast collection of the finest laminated glass products. Whether your custumers requires bullet resistance, increased energy efficiency or a creative design, PRL’s the place to shop. 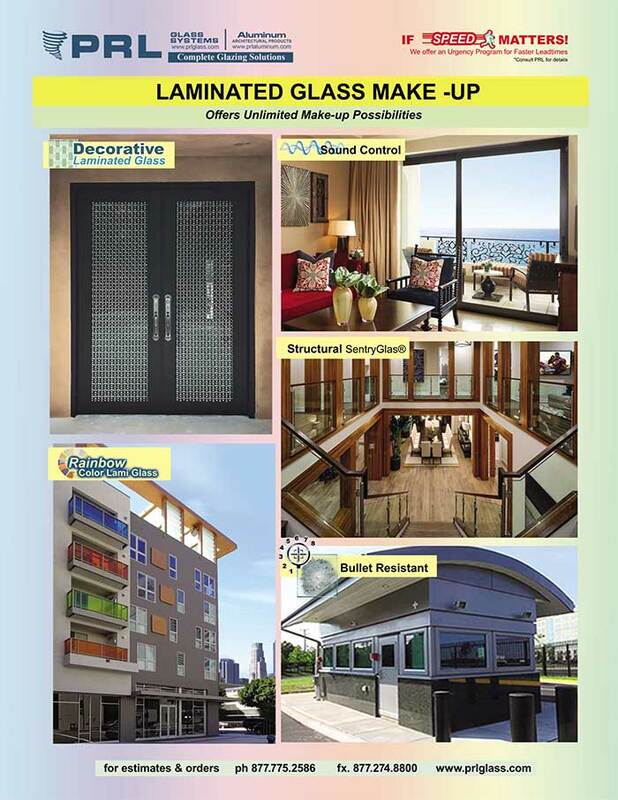 We supply everything from safety glass, laminated IG units and sound control options to decorative and colored glass. Stocked with a large inventory of premium quality interlayers, our laminated glass capabilities leave no stone unturned. PRL carries clear and three white PVB coatings, Structural SentryGlas® and bullet resistant glass up to level 8 ammunitions. We also furnish 12 Rainbow colors and unlimited custom Decorative interlayers utilizing fabrics, woods and veneer. Enjoy our video and learn how laminated glass is manufactured in-house. For the best assortment of laminated glass, look no further than PRL Glass & Aluminum. Once you have it, you’ll love it. On the job and need quick access to our CAD, BIM or specs? 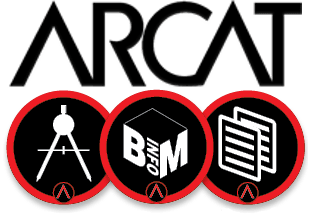 Visit our ARCAT® page! Accessible from your phone or computer, you can get the info you need in a flash. PRL is your leading Tempered and Laminated Glass Supplier.